I'm using VC 7.7.1 and i'm having issues connecting to sharepoint online. "cannot contact site at specified url"
I'm having the same issue, just wondering what the correct format of the authentication fields is. 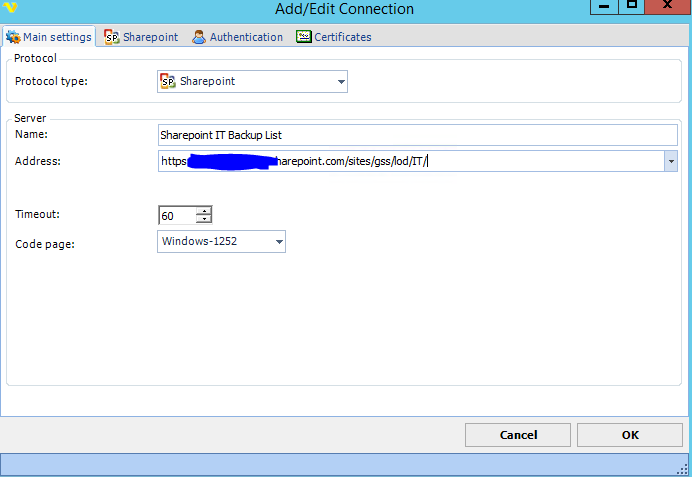 I have a test sharepoint site up called DepotReports just to see if we can get visual cron integration going. I'm just getting "Cannot contact site at specified URL" most of the time, otherwise it just times out when trying things like putting the domain in front of the username. Just wanted to update that I got this working today! 1 user thanked Luke Saunders for this useful post.